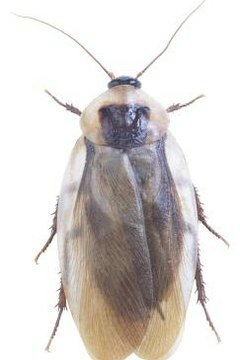 The palmetto bug (Periplameta americana), also known as the American cockroach, is the largest of the insects collectively known as roaches commonly found in and around homes in North America. In the northern states they are generally only found in large industrial buildings and sewers but in the south, they can be a real problem in homes. The palmetto bug averages 1.5 to 2 inches in length with the males appearing slightly longer than the females because their wings extend beyond the end of their abdomen. They are reddish brown with a yellow or tan band just behind their heads. Both males and females have wings although they rarely fly. Under ideal conditions they may live as long as 2 years from egg through nymph to adult. The American cockroach thrives anywhere it is warm, dark and damp. In nature they prefer woodpiles, mulch, piles of decaying leaves and around the bases of trees. In homes then tend to be found in basements, laundry rooms, bathrooms and under sinks. There is no worry as to whether they will be able to find enough food in these areas because they have the unique ability to digest just about anything organic; decaying wood or plants, fungi, other insects, algae, paper, grease, meat, processed grains and animal feeds. The female palmetto bug announces that she is ready to breed by raising her wings into the air and releasing a pheromone to attract males. A male will signal his acceptance of her by flapping his own wings. If she accepts his advances, the male will back into the female and deposit his sperm. Once she has bred a single time, the female can lay fertile eggs for the rest of her life. A day or two after mating the female will deposit her first egg capsule, or ootheca, using her saliva to attach it to a branch, wall, plant stalk or other damp place where it is likely to go undisturbed. The capsule contains an average of fifteen eggs. She will deposit about one ootheca a week for the next 15 to 20 weeks, the remainder of her life span. The eggs hatch into nymphs in 50 to 55 days. Nymphs are the larval stage of the palmetto bug. They will go through a series of 10 to 15 molts, the first actually occurring before they leave the egg, over the next 6 to 12 months before they reach adulthood. Starting out tiny, less than a quarter of an inch long, and greyish brown, they grow and change color with every molt gradually reaching the reddish brown color and size seen in adults. Barbara Taliaferro is an animal enthusiast who lives in Ambler, Pa. She holds a Bachelor's Degree in Animal Science and has spent most of her life working with animals and the people who love them. She has been sharing her love and knowledge of animals through the written word since 2009. What Is the Symbiotic Relationship between Fig Wasps & Figs? What Is the Lifespan of Cecropia Moths?